Really great leaders in any walk of life never take their talents for granted. They turn to the expertise of a great coach to provide the advice to keep them on track. 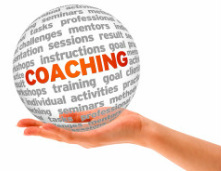 The coach assesses the specific needs and concerns of the individual and develops a confidential, individually customized approach to diagnose, teach, coach and counsel the individual until new techniques are learned and integrated, new attitudes and behaviors are formed, and more effective results are achieved. Whether your desire is to be a better, more persuasive communicator, lead by example, develop more effective and meaningful relationships and partnerships with others, change limiting belief systems, or become more relaxed and confident - private one on one coaching can create a personalized program to get you where you want to be. The first step in the coaching process is a free phone consultation to assess your specific needs, concerns and goals. From that call we will put together a course of action to help you achieve your goals as quickly and effectively as possible. We have found that depending on what you want to work on, it usually takes a minimum of two sessions to achieve a concrete outcome. We can provide coaching at your place of business, using Skype or in some cases depending on what you are working on, just in a phone conversation.